Narrabri Shire is full of surprises and can cater for all of your business and individual requirements. 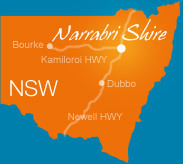 Narrabri Shire is conveniently located halfway between Brisbane and Sydney. It is two and a half hours from the Queensland border and is well serviced by road, rail and air. The Shire’s largest town of Narrabri is positioned on the crossroads of the Newell and Kamilaroi Highways. Regardless of whether you are passing through, staying for a short break or looking to relocate your business or family – Narrabri Shire is exactly what you are looking for. Narrabri Shire is an exciting area of regional New South Wales with plenty to offer anyone wishing to pursue a vibrant and busy country lifestyle. The expansive blue sky, stunning mountain ranges, scenic water ways and fresh air will encourage you to explore and share your experiences from this diverse area. A range of outdoor festivals are celebrated throughout the year. There are a wide range of social, cultural and sporting events to keep people of all ages and tastes entertained. Narrabri Shire residents are never bored with the amount of activities available for the whole family. Narrabri Shire is a modern regional growth centre encompassing a strong business community without the stresses and pressures of a city environment. The area has diversified from its traditional agricultural base of grain, cotton, wool, beef and prime lamb production to coal mining & gas extraction and exploration. The advent of these new resource based industries in conjunction with ancillary business is providing a breadth and depth of job opportunities for the Shire. Explore our Towns and Villages through the Section Links on this page.